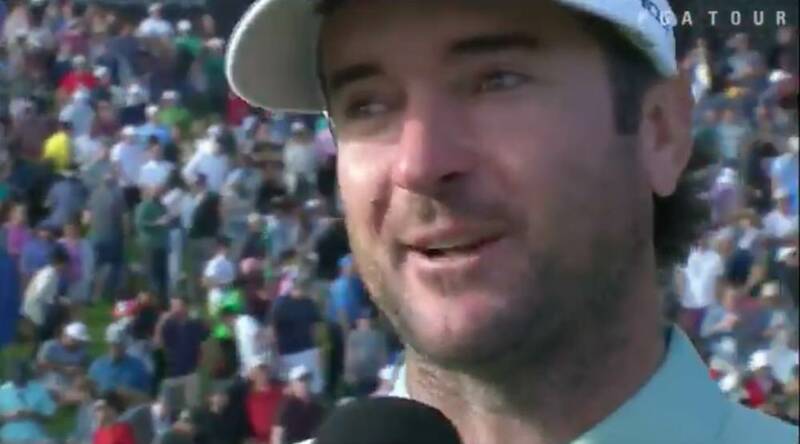 Graeme McDowell had a day to forget as an emotional Bubba Watson returned to the world's top 50 with his third Genesis Open win in five years. Without a victory since his 2016 win at storied Riviera Country Club, the flamboyant left-hander (39) closed with a two-under 69 to win by two shots from Tony Finau and Kevin Na on 12-under par and join Arnold Palmer, Ben Hogan, Lloyd Mangrum and Macdonald Smith as a three-time winner at the great Los Angeles venue. There were tears on the final green from the sometimes eccentric Floridian, who lost up to 30 lbs through diet and illness and plummeted in the world rankings over the past two years. “My ball speed, my swing, everything changed,” he said. “It was the lowest point I've ever been at in the game of golf. The last year-and-a-half, almost two years, give or take, it's been a struggle because I want to be at the top. “This day and age, to get 10 wins on the PGA TOUR, the greatest tour in the world… I am thrilled. McDowell is now in the same position Watson found himself until yesterday, his hopes of refilling “the confidence tank” following his slip to 219th in the world suffering a major hiccup when he made six bogeys in seven holes from the ninth, hitting just three fairways as he shot a six-over 77 to finish tied 26th on two-under. Tied for third, just two shots behind Watson overnight, the 2010 US Open champion (38) birdied the par-five first but three-putted the third to remain two adrift of the left-hander and local boy Patrick Cantlay, fourth in the end with Scott Stallings, with ten holes to go. He needed his putter to warm up, but it remained in deep freeze and his title challenge went cold instead as he made five bogeys in six holes from the ninth, where he missed the green with his third. After bunkering his drive in the right-hand bunker at the 10th, he had no green to work with and thinned his recovery over the green trying to hit a high-spin shot to a tight, back right pin. He chipped back to around 10 feet but the par putt failed to drop and as Na hit a wedge close from 80 yards and made birdie to launch a back nine challenge, McDowell proved mortally wounded. Forced to lay up at the par-five 11th, he found sand trying to attack a tight pin with his third and dropped another shot, then missed the green at the 12th and bogeyed there too. With his week, so full of positives, now slipping away, he three-putted the 14th and bogeyed the 15th to take some of the gloss off what was an otherwise hugely encouraging performance. Putting four solid rounds together has been McDowell’s biggest challenge in recent seasons and he will be trying hard to draw as many positives as he can from Riviera Country Club. It was the opposite for Watson, who went out in one-over to trail Cantlay by a stroke but found a friend in the putter, his Achilles’ heel many times in the past, to win in style. As the likes of Stallings and Phil Mickelson failed to keep their title charges going, Watson crucially holed a nine footer for birdie at the 11th and seven footers for par at the 12th and 13th before holing 15-yard bunker shot for birdie two at the 14th to lead by two strokes on 11-under. "I’m just going to hole it and then go straight to the bathroom,” Watson told Cameron Smith before duly doing just that having asked the young Australian were the nearest Portakabin was to be found. Finau and Na birdied the 17th to close within one, but couldn't birdie the 18th and two-time Masters champion Watson duly birdied the penultimate par-five before close out his 10th PGA Tour triumph with an eight-footer at the last. As Pádraig Harrington closed with an up and down, three-over 74 to finish tied 64th on five-over, Rory McIlroy saved the best for last, finishing with back-to-back birdies to follow Saturday's 73 with a three-under 68 for a share of 20th on three-under. "I feel like I played better than the result suggested," McIlroy said. "I was a little scrappy here and there but I played okay. Nothing to be discouraged by in any way. I feel good about my game going into next week at the Honda. McIlroy remains 10th in the world and without a win since September 2016 - his longest winless streak since he turned professional in 2007. He’d like to break that run before the Masters or at least contend seriously for a PGA Tour win in the same way he contended in Abu Dhabi and Dubai. He’s midway through the busiest pre-Masters schedule of his career and after following a top three finish in Abu Dhabi and a runner-up finish in Dubai with a missed cut and a tie for 20th, he’s happy with his heavy schedule. "This is my fourth event this year and I am enjoying it. I missed playing and being competitive last year. I only played 18 or 19 events last year so I want to play much more this year. "Now that my body is in good shape and I am in full health, there is no reason why I shouldn’t play a lot and try to put myself in contention most weeks that I play. "I am enjoying it, I am enjoying getting on a run, looking forward to next week and hopefully I can go a bit better than I did here."